Viral hemorrhagic fevers (VHFs) are a group of febrile illnesses caused by RNA viruses from several viral families. These highly infectious viruses lead to a potentially lethal disease syndrome characterized by fever, malaise, vomiting, mucosal and gastrointestinal (GI) bleeding, edema, and hypotension. Four viral families are known to cause VHFs in humans: Arenaviridae, Bunyaviridae, Filoviridae, and Flaviviridae. General characteristics of these viral families can be found in the table below. The image below depicts palatal petechiae and hemorrhage in a patient with Ebola virus disease (EVD). Also, see the 11 Travel Diseases to Consider Before and After the Trip slideshow to help identify and manage infectious travel diseases. 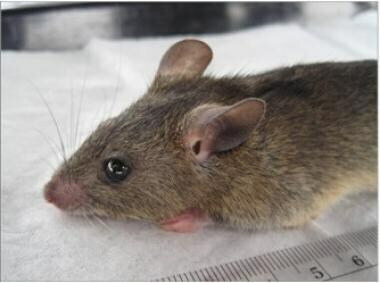 Arenaviridae are spread to humans by rodent contact and include Lassa virus in Africa and several rare South American hemorrhagic fevers such as Machupo, Junin, Guanarito, and Sabia. Lassa virus is the most clinically significant of the Arenaviridae, accounting for serious morbidity and mortality in West Africa. Mastomys natalensis, natural host of Lassa virus. Photo courtesy of BioMed Central, originally published in Kelly JD, Barrie MB, Ross RA, Temple BA, Moses LM, Bausch DG. Housing equityfor health equity: a rights-based approach to the control of Lassa fever inpost-war Sierra Leone. BMC Int Health Hum Rights. 2013 Jan 2;13:2. This group includes Rift Valley fever (RVF) virus, Crimean-Congo hemorrhagic fever (CCHF) virus, and several hantaviruses. The RVF and CCHF viruses are both arthropod-borne viruses. RVF virus, an important African pathogen, is transmitted to humans and livestock by mosquitos and by the slaughter of infected livestock. CCHF virus is carried by ticks and causes a fulminant, highly pathogenic form of VHF notable for aerosol transmission of infective particles (see the image below). Outbreaks of CCHF have occurred in Africa, Asia, and Europe. 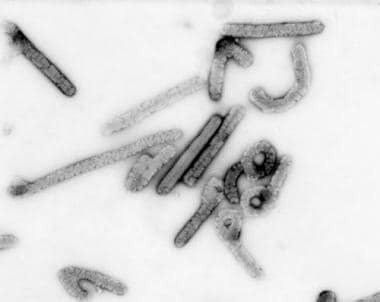 The most notorious of the VHF viruses, Ebola and Marburg viruses, belong to the Filoviridae family. Both viruses originated in sub-Saharan Africa. Ebola virus (see the image below) was first described in 1976 after outbreaks of a febrile, rapidly fatal hemorrhagic illness were reported along the Ebola River in Zaire (now the Democratic Republic of the Congo) and Sudan. Sporadic outbreaks have continued since that time, usually in isolated areas of central Africa. An outbreak in Kikwit, Zaire, in 1995 led to 317 confirmed cases, with an 81% mortality rate. Two thirds of the cases were in health care workers caring for infected individuals. An outbreak in Uganda in late 2000 resulted in 425 cases and claimed 225 lives. The largest Ebola outbreak to date occurred in West Africa from 2014 to 2016. This outbreak primarily occurred in Guinea, Sierra Leone, and Liberia, with >28,000 cases and >11,000 deaths. As a result of this outbreak, several sporadic cases of imported Ebola virus disease also occurred in industrialized nations, including the United States, the United Kingdom, Spain, and Italy. 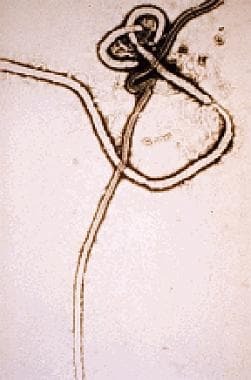 Marburg virus (see the image below), named after the German town where it first was reported in 1967, is another highly pathogenic member of the Filoviridae family that is traced to central Africa. As with Ebola virus, the natural host for the virus is likely the fruit bat. Marburg virus was contracted by a traveler to central Africa in 1987 and has been endemic since 1998 in Durba, Democratic Republic of the Congo, and in persons exposed in caves or mines. Marburg virus. Negative stain image courtesy of the Centers for Disease Control and Prevention. Yellow fever and dengue fever are the most well-known diseases caused by flaviviruses. Both are mosquito-borne; yellow fever is found in tropical Africa and South America, and dengue fever is found in Asia, Africa, and the Americas. They are notable for their significant effect on prior military campaigns and their continued presence throughout endemic areas. The primary defect in patients with viral hemorrhagic fever (VHF) is that of increased vascular permeability. 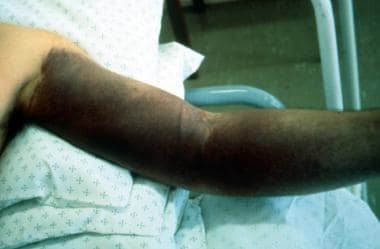 Hemorrhagic fever viruses have an affinity for the vascular system, leading initially to signs such as flushing, conjunctival injection, and petechial hemorrhages, usually associated with fever and myalgias. Later, frank mucous membrane hemorrhage may occur, with accompanying hypotension, shock, and circulatory collapse. The relative severity of the clinical presentation may vary depending on the virus in question, amount, and route of exposure. In acute disease, patients are extremely viremic, and messenger ribonucleic acid (mRNA) evidence of multiple cytokine activation exists. In vitro studies reveal these cytokines lead to shock and increased vascular permeability, the basic pathophysiologic processes most often seen in viral hemorrhagic fever infection. Another prominent pathologic feature is pronounced macrophage involvement. Inadequate or delayed immune response to these novel viral antigens may lead to rapid development of overwhelming viremia. Extensive infection and necrosis of affected organs also are described. Hemorrhagic complications are multifactorial and are related to hepatic damage, consumptive coagulopathy, and primary marrow injury to megakaryocytes. Aerosol transmission of some viral hemorrhagic fever infections is reported among nonhuman primates and likely is a mode of transmission in patients with severe infection. Multisystem organ failure affecting the hematopoietic, neurologic, and pulmonary systems often accompanies the vascular involvement. Hepatic involvement varies with the infecting organism and is at times seen with Ebola, Marburg, RVF, CCHF, and yellow fever. Renal failure with oliguria is a prominent feature of HFRS seen in Hantavirus infection and may be seen in other VHFs as intravascular volume depletion becomes more pronounced. Bleeding complications are particularly prominent with Ebola, Marburg, CCHF, and the South American arenaviruses. Although the pathophysiology of dengue infection is complex and incompletely understood, severe dengue infection can be differentiated from milder forms by the presence of increased vascular permeability. The greatest risk factor for severe dengue infection is secondary infection with a dengue serotype different from the initial dengue infection. This increased vascular permeability is thought to be secondary to widespread T-cell activation and apoptosis and is also thought to be related to a process known as antibody-dependent enhancement, best described as the balance between neutralizing versus enhancing antibodies after an initial dengue infection, which can contribute to the severity of secondary dengue infection. During the 2014-2016 Ebola outbreak in West Africa, 2 imported cases were reported in the United States, including one death, as well as two locally acquired cases in healthcare workers. In 1989, an outbreak of hemorrhagic fever among imported macaque monkeys in Reston, Virginia, led to the discovery of Reston ebolavirus, a variant of Ebola virus that originated in the Philippines and does not cause disease in humans. Lassa fever is responsible for an estimated 100,000-300,000 infections per year, with 5,000 deaths. Cases have been reported throughout West Africa, particularly in Nigeria, Sierra Leone, Guinea, and Liberia. Other arenaviruses are responsible for sporadic VHF outbreaks throughout South America. Rift Valley fever (RVF) virus and Crimean-Congo hemorrhagic fever (CCHF) are responsible for intermittent epidemics in Africa (for RVF) and in areas of Africa, Asia, and Europe (for CCHF). HFRS due to Hantavirus infection continues to be an ongoing health concern, particularly in Asia, affecting up to 200,000 patients annually. Dengue Virus Notice posted outside Maracanã Stadium, Rio de Janeiro, Brazil, 2012. 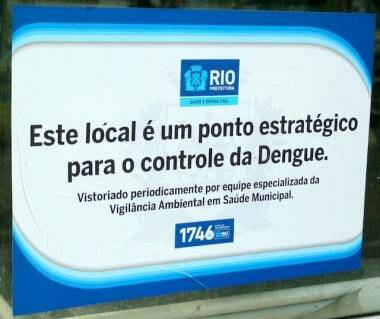 Translation: This site is a strategic point for controlling Dengue. Case-fatality rates of patients with VHF vary from less than 10% (eg, in dengue HF) to as high as 90%, as has been reported in some filovirus outbreaks. The case-fatality rate for the 2014-2016 West Africa Ebola outbreak was ~40%. Complications from VHF infection include retinitis, orchitis, hepatitis, transverse myelitis, and uveitis. In patients who recover from Lassa fever infection, deafness is the most common complication. Spontaneous abortion also is common. Renal insufficiency is associated with HFRS infection. Towner JS, Sealy TK, Khristova ML, et al. Newly discovered ebola virus associated with hemorrhagic fever outbreak in Uganda. PLoS Pathog. 2008 Nov. 4(11):e1000212. [Medline]. Normile D. Emerging infectious diseases. Scientists puzzle over Ebola-Reston virus in pigs. Science. 2009 Jan 23. 323(5913):451. [Medline]. Hayman DT, Yu M, Crameri G, et al. Ebola virus antibodies in fruit bats, Ghana, West Africa. Emerg Infect Dis. 2012 Jul. 18(7):1207-9. [Medline]. [Full Text]. Knust B, Schafer IJ, Wamala J, Nyakarahuka L, Okot C, Shoemaker T, et al. Multidistrict Outbreak of Marburg Virus Disease-Uganda, 2012. J Infect Dis. 2015 Oct 1. 212 Suppl 2:S119-28. [Medline]. Lupi O. Mosquito-borne hemorrhagic fevers. Dermatol Clin. 2011 Jan. 29(1):33-8. [Medline]. Amorosa V, MacNeil A, McConnell R, Patel A, Dillon KE, Hamilton K, et al. Imported Lassa fever, Pennsylvania, USA, 2010. Emerg Infect Dis. 2010 Oct. 16 (10):1598-600. [Medline]. [Full Text]. Marx G, Stinson K, Deatrich M, Albanese B. Notes from the Field: Hantavirus Pulmonary Syndrome in a Migrant Farm Worker - Colorado, 2016. MMWR Morb Mortal Wkly Rep. 2017 Jan 20. 66 (2):62-63. [Medline]. [Full Text]. Chevalier MS, Chung W, Smith J, Weil LM, Hughes SM, Joyner SN, et al. Ebola virus disease cluster in the United States--Dallas County, Texas, 2014. MMWR Morb Mortal Wkly Rep. 2014 Nov 21. 63 (46):1087-8. [Medline]. [Full Text]. CDC. Locally acquired Dengue--Key West, Florida, 2009-2010. MMWR Morb Mortal Wkly Rep. 2010 May 21. 59(19):577-81. [Medline]. Centers for Disease Control and Prevention. Ebola (Ebola Virus Disease). CDC. Available at https://www.cdc.gov/vhf/ebola/about.html. February 18, 2016; Accessed: December 23, 2016. Yellow Fever. World Health Organization. Available at http://www.who.int/mediacentre/factsheets/fs100/en/. May 2016; Accessed: March 15, 2017. Paules CI, Fauci AS. Yellow Fever - Once Again on the Radar Screen in the Americas. N Engl J Med. 2017 Mar 8. [Medline]. Bhatt S, Gething PW, Brady OJ, Messina JP, Farlow AW, Moyes CL, et al. The global distribution and burden of dengue. Nature. 2013 Apr 25. 496 (7446):504-7. [Medline]. Government of Rio de Janeiro. Number of Dengue Cases per month, Planning Areas, Administrative Regions and Neighborhoods, Municipality of Rio de Janeiro, 2016. Available at http://www.rio.rj.gov.br/dlstatic/10112/6790445/4185133/denguenotificadosexcetodescartados2016MES.pdf. . Accessed: March 10, 2017. Scott JT, Sesay FR, Massaquoi TA, Idriss BR, Sahr F, Semple MG. Post-Ebola Syndrome, Sierra Leone. Emerg Infect Dis. 2016 Apr. 22 (4):641-6. [Medline]. [Full Text]. Sissoko D, Duraffour S, Kerber R, Kolie JS, Beavogui AH, et al. Persistence and clearance of Ebola virus RNA from seminal fluid of Ebola virus disease survivors: a longitudinal analysis and modelling study. Lancet Glob Health. 2017 Jan. 5 (1):e80-e88. [Medline]. van Griensven J, Bah EI, Haba N, Delamou A, Camara BS, Olivier KJ, et al. Electrolyte and Metabolic Disturbances in Ebola Patients during a Clinical Trial, Guinea, 2015. Emerg Infect Dis. 2016 Dec. 22 (12):[Medline]. [Full Text]. Qiu X, Wong G, Audet J, Bello A, Fernando L, et al. Reversion of advanced Ebola virus disease in nonhuman primates with ZMapp. Nature. 2014 Oct 2. 514 (7520):47-53. [Medline]. [Full Text]. PREVAIL II Writing Group., Multi-National PREVAIL II Study Team., Davey RT Jr, Dodd L, Proschan MA, Neaton J, et al. A Randomized, Controlled Trial of ZMapp for Ebola Virus Infection. N Engl J Med. 2016 Oct 13. 375 (15):1448-1456. [Medline]. [Full Text]. Burgeson JR, Moore AL, Gharaibeh DN, et al. Discovery and optimization of potent broad-spectrum arenavirus inhibitors derived from benzimidazole and related heterocycles. Bioorg Med Chem Lett. 2013 Feb 1. 23(3):750-6. [Medline]. Lee AM, Pasquato A, Kunz S. Novel approaches in anti-arenaviral drug development. Virology. 2011 Mar 15. 411(2):163-9. [Medline]. [Full Text]. De Clercq E. A Cutting-Edge View on the Current State of Antiviral Drug Development. Med Res Rev. 2013 Mar 11. [Medline]. Jiang X, Dalebout TJ, Bredenbeek PJ, et al. Yellow fever 17D-vectored vaccines expressing Lassa virus GP1 and GP2 glycoproteins provide protection against fatal disease in guinea pigs. Vaccine. 2011 Feb 1. 29(6):1248-57. [Medline]. Morrison D, Legg TJ, Billings CW, Forrat R, Yoksan S, Lang J. A novel tetravalent dengue vaccine is well tolerated and immunogenic against all 4 serotypes in flavivirus-naive adults. J Infect Dis. 2010 Feb 1. 201(3):370-7. [Medline]. Kibuuka H, Berkowitz NM, Millard M, Enama ME, Tindikahwa A, et al. Safety and immunogenicity of Ebola virus and Marburg virus glycoprotein DNA vaccines assessed separately and concomitantly in healthy Ugandan adults: a phase 1b, randomised, double-blind, placebo-controlled clinical trial. Lancet. 2015 Apr 18. 385 (9977):1545-54. [Medline]. Agnandji ST, Huttner A, Zinser ME, et al. Phase 1 Trials of rVSV Ebola Vaccine in Africa and Europe. N Engl J Med. 2016 Apr 28. 374 (17):1647-60. [Medline]. [Full Text]. Leroy EM, Kumulungui B, Pourrut X, Rouquet P, Hassanin A, Yaba P. Fruit bats as reservoirs of Ebola virus. Nature. 2005 Dec 1. 438(7068):575-6. [Medline]. Amman BR, Carroll SA, Reed ZD, Sealy TK, Balinandi S, et al. Seasonal pulses of Marburg virus circulation in juvenile Rousettus aegyptiacus bats coincide with periods of increased risk of human infection. PLoS Pathog. 2012. 8 (10):e1002877. [Medline]. [Full Text]. Leroy EM, Epelboin A, Mondonge V, et al. Human Ebola Outbreak Resulting from Direct Exposure to Fruit Bats in Luebo, Democratic Republic of Congo, 2007. Vector Borne Zoonotic Dis. 2009 Mar 26. [Medline]. Johansen LM, Brannan JM, Delos SE, et al. FDA-Approved Selective Estrogen Receptor Modulators Inhibit Ebola Virus Infection. Sci Transl Med. 2013 Jun 19. 5(190):190ra79. [Medline]. Ranjit S, Kissoon N. Dengue hemorrhagic fever and shock syndromes. Pediatr Crit Care Med. 2011 Jan. 12(1):90-100. [Medline]. Tuffs A. Experimental vaccine may have saved Hamburg scientist from Ebola fever. BMJ. 2009 Mar 23. 338:b1223. [Medline]. Blaney JE, Wirblich C, Papaneri AB, et al. Inactivated or live-attenuated bivalent vaccines that confer protection against rabies and Ebola viruses. J Virol. 2011 Oct. 85(20):10605-16. [Medline]. [Full Text]. CDC. Outbreak of Ebola hemorrhagic fever Uganda, August 2000-January 2001. MMWR Morb Mortal Wkly Rep. 2001 Feb 9. 50(5):73-7. [Medline]. Colebunders R, Borchert M. Ebola haemorrhagic fever--a review. J Infect. 2000. 40(1):16-20. [Medline]. Feldmann H, Geisbert TW. Ebola haemorrhagic fever. Lancet. 2011 Mar 5. 377(9768):849-62. [Medline]. Geisbert TW, Daddario-Dicaprio KM, Geisbert JB, et al. Vesicular stomatitis virus-based vaccines protect nonhuman primates against aerosol challenge with Ebola and Marburg viruses. Vaccine. 2008 Dec 9. 26(52):6894-900. [Medline]. Geisbert TW, Hensley LE. Ebola virus: new insights into disease aetiopathology and possible therapeutic interventions. Expert Rev Mol Med. 2004 Sep 21. 6(20):1-24. [Medline]. Hartman AL, Towner JS, Nichol ST. Ebola and marburg hemorrhagic fever. Clin Lab Med. 2010 Mar. 30(1):161-77. [Medline]. Holmes GP, McCormick JB, Trock SC, et al. Lassa fever in the United States. Investigation of a case and new guidelines for management. N Engl J Med. 1990. 323(16):1120-3. [Medline]. Schmidt AC. Response to dengue fever--the good, the bad, and the ugly?. N Engl J Med. 2010 Jul 29. 363(5):484-7. [Medline]. Towner JS, Rollin PE, Bausch DG, et al. Rapid diagnosis of Ebola hemorrhagic fever by reverse transcription-PCR in an outbreak setting and assessment of patient viral load as a predictor of outcome. J Virol. 2004 Apr. 78(8):4330-41. [Medline]. Ewer K, Rampling T, Venkatraman N, et al. A Monovalent Chimpanzee Adenovirus Ebola Vaccine Boosted with MVA. N Engl J Med. 2016 Apr 28. 374 (17):1635-46. [Medline]. [Full Text]. Uyeki TM, Mehta AK, Davey RT Jr, et al. Clinical Management of Ebola Virus Disease in the United States and Europe. N Engl J Med. 2016 Feb 18. 374 (7):636-46. [Medline]. [Full Text]. Infection Prevention and Control Recommendations for Hospitalized Patients Under Investigation (PUIs) for Ebola Virus Disease (EVD) in U.S. Hospitals. Centers for Disease Control and Prevention. Available at https://www.cdc.gov/vhf/ebola/healthcare-us/hospitals/infection-control.html. September 3, 2015; Accessed: March 15, 2017. Ebola Virus Disease (EVD) Information for Clinicians in U.S. Healthcare Settings. Centers for Disease Control and Prevention. Available at https://www.cdc.gov/vhf/ebola/healthcare-us/preparing/clinicians.html. May 24, 2016; Accessed: March 15, 2017. Agnandji ST, Huttner A, Zinser ME, Njuguna P, Dahlke C, et al. Phase 1 Trials of rVSV Ebola Vaccine in Africa and Europe. N Engl J Med. 2016 Apr 28. 374 (17):1647-60. [Medline]. [Full Text]. Mastomys rodent, natural host of Lassa virus. Image courtesy of the Centers for Disease Control and Prevention. Apodemus agrarius, the vector of Korean hemorrhagic fever caused by a hantavirus. Photo courtesy of David McClain, MD. Bunyavirus infection - Hantaan virus. Patient with Korean hemorrhagic fever caused by Hantaan virus demonstrating typical 'sunburn flush' of cheeks, chin, and base of neck. Photo courtesy of John Huggins, PhD. Bunyavirus infection. A patient with Korean hemorrhagic fever demonstrating conjunctival hemorrhages, facial petechiae, and "sunburn flush" of the cheeks. Photo courtesy of John Huggins, PhD. Patient with morbilliform exanthem of dengue fever. Note islands of sparing, which is characteristic for dengue. Photo courtesy Duane Gubler, PhD. Patient with dengue hemorrhagic fever complicated by ecchymoses. Photo courtesy of Duane Gubler, PhD. The authors and editors of Medscape Drugs & Diseases gratefully acknowledge the contributions of previous author, Thomas W McGovern, MD, to the development and writing of this article.